I find it quite entertaining when bands perform in the really old-school black metal spirit in a worthy way. While many Darkthrone or Burzum's offspring desperately try to sound like their masters without sounding otherwise than trying but not coping, the "true spirit" comes effortless for Throne of Katarsis. The fact that the mainman is an accomplished musician may naturally help. One won't listen to such a band to find something unheard, one knows what one's going to get. 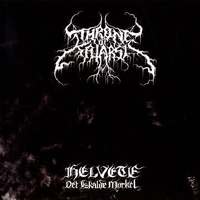 Throne of Katarsis' Helvete - Det iskalde Mørket is a standard representation of the genre with its dissonant long, longer and even longer riffs (a set of five tracks in fifly-five minutes) that glide the one into the other; for those who felt for Darkthrone's first recordings for instance, the cool reverb effects, perhaps a little artificial, laid on purpose, as I believe Grimnisse and Stein (ex-Einherjer) from Black Dimensions Studio wouldn't let it just happen. The names of Burzum or Satyricon (search for the rearranged riffs!) will obviously come to mind, though Throne of Katarsis exposes more technique than many necro black metal musicians. But then, what else expect from Thundra's guitarist? The rhetorical question finally: have TOK succeeded at what they aimed for? Couldn't deny it. Their ordered chaos will definitely haunt my chambers on a regular basis. By the way, knowing the guys, I have to say that not taking oneself seriously proves to pay off! Now I mean it's your own turn to listen to Helvete and experience the band live!